Try conservative measures first to control pain, and know the limits and risks of cortisone shots if you choose to try it. Most people who suffer from back pain already know the drill: time heals this wound. Over weeks to months, the pain will calm down, and you will slowly return to your normal life. In the meantime, try to stay as active as possible and rely as much as possible on over-the-counter pain relievers to help avoid needing a cortisone shots. Doctors call these shots corticosteroid injections. But for some, these conservative measures may not relieve the agony soon enough—especially if the problem is back pain caused by irritated spinal nerves. After a few weeks, just getting to the bathroom may start to feel like Napoleon's winter march in Russia. At that point, you may be offered a cortisone injection to calm the war zone in your lower back. Even for nerve-related back pain, guidelines discourage hasty intervention with cortisone shots . "You would do less invasive, less aggressive things first," says Dr. Robert Shmerling, an associate professor of medicine at Harvard-affiliated Beth Israel Deaconess Medical Center. Epidural space. Epidural injections target the area around the spinal cord where nerve "roots" exit and extend to other parts of the body. The area near the nerve roots may be the source of low back pain, such as sciatica. Tendons and bursae. Cortisone shots are used for tendinitis—inflammation of a tendon, the tough, fibrous cord of tissue that connects muscle to bone. Steroids may also be used to calm down an inflamed bursa (bursitis). Bursae are cushioning pads of tissue that reduce friction between muscles and tendons as they move across bones and other joint structures. Joints. Cortisone is sometimes injected into a joint to calm inflammation related to arthritis. Common targets are the knee and the facet joints in the spine. Cortisone shots are not for ordinary strain-and-sprain backaches. Orthopedic specialists usually offer it for shooting nerve pain (sciatica) from a ruptured disk, or symptoms associated with narrowing of the space around the spinal cord (spinal stenosis). To control pain, first try nonsteroidal anti-inflammatory drugs (NSAIDs), such as ibuprofen (Advil, Motrin), naproxen (Aleve), and plain old aspirin. If that doesn't work, ask your doctor about other medications for nerve-related pain. Narcotic pain relievers should be used only for the short term, if at all. These include hydrocodone (Vicodin) and oxycodone (OxyContin, Percocet). Keep moving as much as you can manage. Short periods of bed rest may be helpful during the acute phase, but extended bed rest isn't. How long should you wait before considering injection therapy? It depends on the intensity of the pain and how long you can bear it before it starts to ease on its own. Most men experience substantial improvement in six to eight weeks. Steroid injections contain various formulations of medications. A common combination is the numbing drug procaine hydrochloride—known to millions of dental patients as Novocain—mixed with the anti-inflammatory drug cortisone. Once the cortisone injection finds its target, the numbing effect will start to wear off within hours. "As the Novocain wears off, the pain may temporarily come back," Dr. Shmerling says. "Then 24 to 48 hours after the injection, you can begin to expect whatever benefit you're going to get." If the cortisone shot works, you'll certainly be grateful for the relief, but success is not guaranteed. 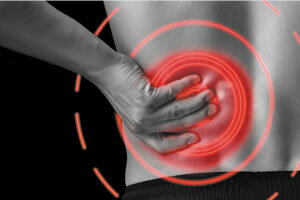 In studies of large groups of back pain sufferers, the benefit is small to none on average. It's hard to predict what you, individually, will experience. Corticosteroid injections do not change the course of a chronic back pain condition. Months down the road, you will generally end up in the same condition as if you never got the shot. In the meantime, the shot could ease your discomfort. Harmful side effects of cortisone injections are uncommon, but they do happen. The main risk is infection, which occurs less than 1% of the time. Less commonly, the needle could injure a nerve or blood vessel. Having too many injections in the same target area can cause nearby tissues, such as joint cartilage or bone, to break down. Corticosteroids can also cause skin at the injection site or the soft tissue beneath it to thin. This is why it's recommended to limit the number of cortisone injections to three or four per year at any body region treated.